Donna Brazile, Yolanda Caraway, Leah Daughtry, and Minyon Moore are four of the most influential African American women in the United States. Together, they call themselves the Colored Girls. As political strategists, organizers, CEOs, and more, they have made history and shaped politics. 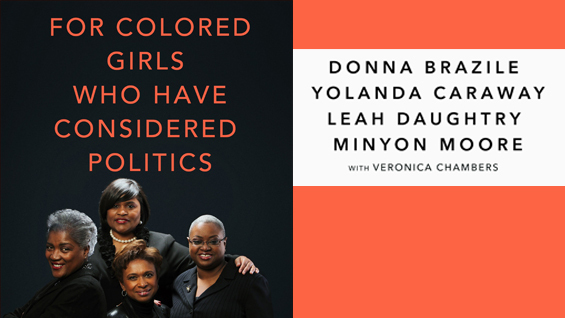 Following the midterm elections, the quartet will discuss their book For Colored Girls Who Have Considered Politics which touches on their friendship and how it has changed politics in America, while offering a roadmap for other women of color with political ambitions. Veronica Chambers, who leads the New York Times' archival storytelling team, moderates the discussion. Strand Book Store will sell books at the event and following the discussion the authors will sign copies. Though they come from diverse backgrounds, Brazile, Caraway, Daughtry, and Moore all felt the call to serve early in their lives. For Caraway, it was volunteering for Bobby Kennedy’s Senate campaign and feeling the thrill of political mobilization. Moore became involved with Jesse Jackson’s Operation PUSH where she was exposed to high-level politics and gained a true sense of purpose. Brazile, who has always been outspoken about what she believes in, started interning in D.C. and worked for Coretta Scott King and Stevie Wonder on the campaign to create a holiday in honor of Dr. Martin Luther King, Jr. Daughtry was born into activism and grew up surrounded by civil rights leadership. Her upbringing allowed her to move between worlds, navigating very different cultural and political spheres. Following the discussion the Strand Book Store will sell books and the authors will sign copies. Donna Brazile, a veteran Democratic political strategist, is an adjunct professor at Georgetown University, author, television political commentator, and former interim chair of the Democratic Party. She was appointed as the 2018-2019 Gwendolyn S. and Colbert I. King Endowed Chair in Public Policy at Howard University. Yolanda Caraway, the founder of The Caraway Group, a nationally recognized public relations firm, has played a major role in shaping the goals and objectives of the Democratic Party for over thirty years. Reverend Leah Daughtry is a nationally recognized pastor, speaker, organizer, political strategist, and CEO of the 2008 and 2016 Democratic National Conventions. Minyon Moore, partner of the Dewey Square Group, was formerly CEO of the Democratic National Committee, Assistant to the President of the United States and director of the White House Office of Public Liaison, and director of White House political affairs under President Bill Clinton. A prolific journalist, editor, and author, Veronica Chambers has held senior editorial roles at Newsweek, Glamour, and more, as well as co-written several books including For Colored Girls Who Have Considered Politics and Yes, Chef with Marcus Samuelsson.